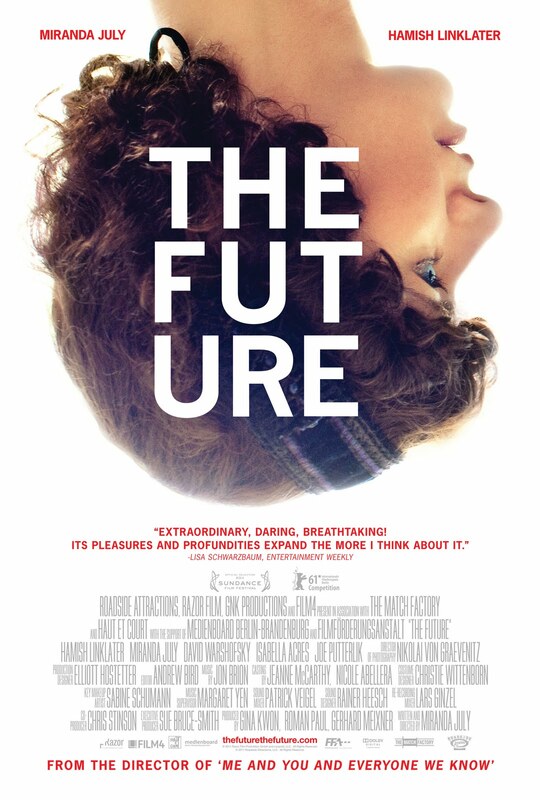 I finally found the time to watch Miranda July’s newest film, The Future. You may have seen in a previous post that I am quite a fan of hers, whether it’s her book writing or screen writing. I love her over-the-top awkward, quirky, emo, indie, hipster ways. Though in my image search for things to include in this post, I found that there are a lot of people who cannot stand MJ and her unconventional ways. I even had to wait for my boyfriend to be out of town to watch the movie, because I am allergic to haterade. tonous daily rut. Their story intertwines with the narration of Paw-Paw, their rescue cat. This is an element that might be hard to take by those who have a weak stomach for July’s quirk. I flinched at some points of this odd narration, especially in the choice to open the movie with it. In the end, Paw-Paw’s monologues were the most heartfelt parts for me. I approached this movie with my thoughts on Me and You and Everyone We Know. I expected a subtly humorous account of real life trials and tribulations through that uncomfortably intimate lens that July uses in her work. I expected a chronological narrative bringing together a myriad of characters, and I expected to take the events of the film at face value. The Future is not that kind of film. It starts off realistic, but as it goes on, you have trouble distinguishing fantasy from reality, the real from the imagined, and the literal from the metaphorical. It stirs up your consciousness a little bit, and I like that. It’s a thinking wo/man’s movie, not to be watched distractedly out of the right eye. It requires a certain amount of engagement, and I liked that. All of the necessary themes are here: relationships and fidelity, life and death, time and space, “mid-life” crises and our attempts to find happiness and fulfillment. I liked it better after it was over and I had time to reflect upon it. It’s a movie I would prefer to watch alone. I leave you with July’s “Shirt Dance.” Love the song: Master of None by Beach House. Toro y Moi does a bitchin’ cover of the song as well. Doesn’t get much more emo/hipster/indie than that!